The new Whip Mix® SinterPro Sintering Furnace takes sintering to the next level. Multiple programs and multi-stage sintering allow for optimization throughout the process. SinterPro is easy to program, easy to use, and versatile. 30 user defined programs and shallow and deep trays that can be used in any combination make SinterPro a valuable addition in any laboratory setting. Its many advanced features give SinterPro true “Set and Forget” ease of use. MULTIPLE PROGRAMS, MULTI-STAGE SINTERING – 30 user-defined programs and four stage sintering allow for optimization of firing programs. HIGH DENSITY PAYLOAD CAPACITY – Two trays with different heights give the furnace capacity real versatility. Use a shallow tray for basic single units and short span bridges, the deep tray for large conventional and Prettau Bridges. REDUCED AMPERAGE REQUIREMENTS – The low 16-20 amp draw requirement (depending on what country you live in) means you will most likely not require custom electrical modifications. POWER FAIL RECOVERY – If the power browns out or blacks out for a short time, especially at night when unattended, the oven will automatically resume the firing cycle at the stage where power failed. confirmed the unit will fail safe. Look around. How many other ovens carry safety certification? (Hint: we see very few!). Idle/Preheat automatically raises the lift if no keys have been pressed for an hour and applies just enough power to keep the muffle between 100° and 200°F. This keeps the muffle from accumulating moisture which can turn into steam on the next run and cause insulation cracks. 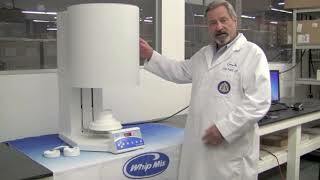 ACCURACY – Like all Whip Mix ovens, the unit is calibrated to +/- 3˚ C tolerance specification. 1570°C max sustained temperature is ideal for sintering zirconia. FIELD SOFTWARE UPGRADEABILITY VIA FLASH DRIVE – convenient upgrades you install means no shipping the furnace back for us to do it!